Confessions of an ADD English Teacher: Dining Room SOS! Today I'm asking for a bit of help with my dining room! So many of you have great ideas and great blogs of your own, I decided to call upon your collective creativity for this space. 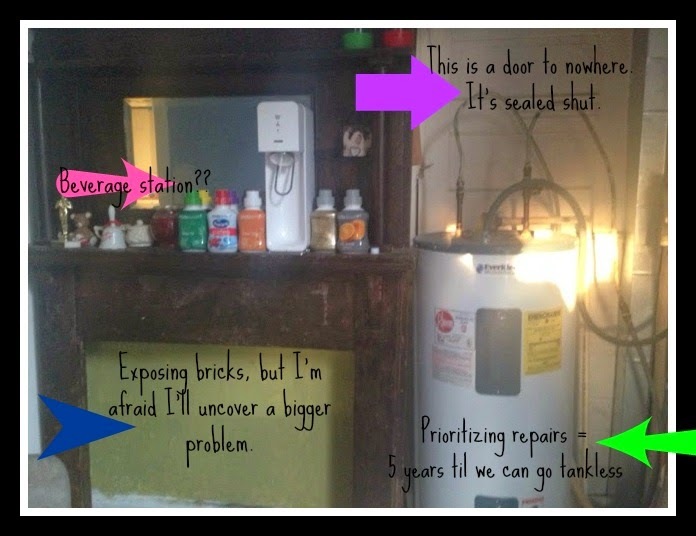 Instead of a solid back wall to the dining room, we have an ugly hot water heater crammed in to a corner. 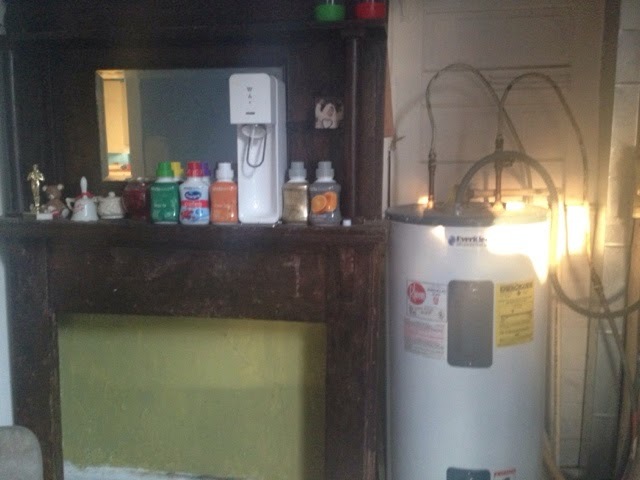 There is a door above the hot water heater. Many years ago, steps occupied the area. They were probably removed when the kitchen was converted to a dining room in 1969. Next to the eye sore, is a fireplace mantle. For some reason, we had two extra mantles in the house when we moved in. Behind the mantle is a brick chimney that was plastered over. Originally, this was the chimney that went with the stove. Hidden behind a false wall is a flue cover. Eventually, I plan to expose the brick. I do like the idea of the mantle and the exposed brick. I don't like the idea of having yet another mantle to decorate. Right now, it's a pretty convenient spot for storing out Soda Stream. It might be fun to make it a sort of beverage station! The hot water heater... It's not like we can move it. I don't know if a beaded doorway is the answer, but it's better than leaving it open. Hit me with your ideas and creative solutions! Thanks! I like the cabinet look idea :) I can't do anything about the mirror since it's an original feature of the mantle!